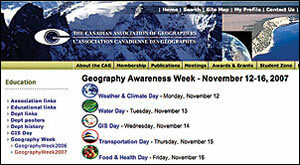 The Canadian Association of Geographers' Web site showing the Theme Days of Geography Awareness Week 2007. 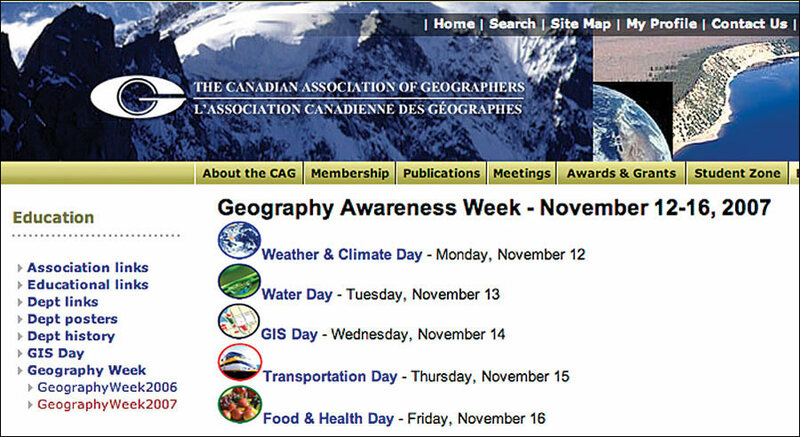 The Theme Days component of Geography Awareness Week (GAW) 2007, which took place November 12�16, was an innovative and perhaps daring Canadian experiment in geographic matters. What was put in place and how it was done are fully consistent with an adage that has guided my approach to curiosity- and client-driven research for four decades. That is, "If the research boat ain't rockin', it ain't movin'." I suggest that we achieved two very important and successful kinds of rocking and moving action as a result of the Theme Days experiment (www.cag-acg.ca/en/geography_week_2007.html). In June of 2006, I was asked to serve as Media Program Director for the Canadian Association of Geographers (CAG), and my task was twofold. First, I had to increase the participation rate of academic geographers in GIS Day 2006 and Geography Awareness Week and, second, to increase the media coverage of both events. Going into those events, two trends stood out: several inquiries revealed that many academic geographers seemed to have little interest in supporting GIS Day or Geography Awareness Week, and it was a major challenge to provide media people with a good reason for doing a story about either event, neither of which seemed to lend itself to easy, eye-catching stories for public consumption. But, after many years in public affairs, I was fully aware that it may not be the product that needs to do all the changing. Those four months of volunteer effort in 2006 resulted in an increased number of geography, environmental sciences, and associated university departments participating in GIS Day 2006. As for media coverage, releases about the two events were picked up by several dozen university newspapers and, as a result of releases and interviews, GIS Day and Geography Awareness Week received perhaps 50 mentions by community and weekly newspapers and cable television stations. To my knowledge, GIS Day and/or Geography Awareness Week were featured in about 10 big media stories, including those by The Weather Network. Nevertheless, in terms of having a significant, societal impact, it became apparent to me that something new and very different had to be done if Geography Awareness Week and GIS Day 2007 were to attract and hold the attention of a large number of Canadians. The important lesson learned was that we needed to go beyond the university-oriented approach for Geography Awareness Week to reach Canadian children, teens, and adults at school, at home, at libraries, at work in government and business, and especially those who visit Web sites for education, entertainment, research, business, and other purposes. Themes are widely used for conference programs, political campaigns, retail promotions, research papers, newspaper editorials, class lessons, databases, and maps. They are particularly useful for organizing thoughts, promoting ideas, creating a sense of focus and coherence, and inciting action. Further, from a project design perspective, the Theme Days model holds much appeal, as opposed to a weeklong theme that could consume huge amounts of time and resources and is likely to overtax people's attention spans. Therefore, the first two decisionsgoing with themes and Theme Dayswere easy. The process of identifying theme topics was output driven and based on several parameters. We wanted to increase attention on Geography Awareness Week, and four elements were central to achieving that outcome in the manner that I envisioned. The topics must be recognized by Canadians as important. The event needed to be the object of continuing media attention. It needed to be present on Canadian Web sites. As a critical feature of the design of GAW 2007, the topics must have an explicit geographic orientation, aspect, nature, perspective, etc., that is generally recognizable and easily demonstrated. The first step in identifying theme day topics was to perform keyword-based searches of the popular, interest group, advocacy group, professional, and other nonacademic literatures. Once a long list of about 30 topics was reached, it was time to consult with geographic and GIS professionals about the four Theme Days to accompany GIS Day. By the annual meeting of the CAG at the end of May 2007, the choices had been made. The Theme Days for that year would be Weather and Climate Day (Monday), Water Day (Tuesday), GIS Day (Wednesday), Transportation Day (Thursday), and Food and Health Day (Friday). 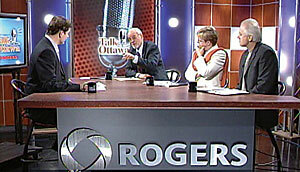 Talk Ottawa host James Hendricks and panelists Barry Wellar (Canadian Association of Geographers), Nancy Schepers (City of Ottawa), and Dennis Jacobs (Ontario Professional Planners Institute) discuss Transportation Day issues. As planning for the 2007 event got under way, we understood that the Internet is an excellent medium for communicating a message to potential readers/viewers quickly, at minimum expense, and that the message can be modified and enhanced over time, again at minimal expense. Given Canada's massive physical geography and its complex human geography, to my mind a Web site approach was the only practical way to effectively connect Canadians with 10 or 50 geographically oriented enterprises during a theme day or Geography Awareness Week, respectively. That said, with Web sites doing the heavy lifting over a broad area, we expected the awareness effort to be enhanced considerably by local media coverage, especially by community newspapers and local cable television stations. Once this was decided, we invited the participation of the large and expanding universe of enterprises across Canada using geographic theories, principles, practices, terms, concepts, methods, techniques, instruments, approaches, data, information, knowledge, software packages, etc. As a result, 50 nonacademic participants featured a selection of these enterprises for the respective Theme Days, and they were listed throughout the event. These links took two forms. Where time permitted us to work out all the details, including a statement about the geography-theme topic connection, we were able to link participating Web sites to the CAG Web site, and individuals clicking on the respective links were connected to their sites of choice. Links to Web sites of interest were also achieved by clicking on the URLs listed for enterprises in one of the five theme day sections. There is no question that the introduction of Theme Days increased both the visibility and the credibility of GIS Day in Canada. By placing GIS Day within the context of Weather and Climate Day, Water Day, Transportation Day, and Food and Health Day, we not only presented the demand side of the equation but also did so in an earnest, open way that was consistent with the education mission of the CAG. Most of the Web sites contain reports, releases, maps, images, etc., that reference or use geographic information systems, sciences, and/or services. Consider the Transport 2000 Canada Web site in particular. The GIS-Transportation Poster Competition combines the tradition of GIS Day posters pioneered by the University of Ottawa and other universities in Canada and the transportation expertise of Transport 2000 Canada. As a result of that competition, more students and Canadians who visited the CAG Web site (www.cag-acg.ca/files/pdf/GAW/GIST.pdf) or the Laboratory for Applied Geomatics and Geographic Information Systems Science Web site (www.geomatics.uottawa.ca/GIST.pdf) became aware of how geographic factors affect all the transport modes. They also learned of the high standard to which student research in the GIS-transportation field can be held when Canadian experts in GIS and transportation combine to set the bar at a demanding level. Furthermore, as for the goal of increasing Canadians' geographic awareness, it may surprise some readers to learn that we achieved that objective in large measure before we posted anything. Simply put, individuals from a number of the participating organizations informed colleagues, professional and corporate members, and others about their involvement in elaborating and illustrating the connection between geography and a theme topic. As a case in point, during the past year Transport 2000 Canada's newsletter, TransportAction, carried at least three articles on the geography-transportation connection and Geography Awareness Week. And, as a second case in point, on several occasions the Ottawa chapter of the Canadian Meteorological and Oceanographic Society (CMOS) notified its members of the geography-weather and climate connection that would be featured during Geography Awareness Week. The use of nonacademic organizations' Web sites to make the geography-subject matter connection, and the broadened scope of players engaged in Geography Awareness Week, was a long-overdue initiative to ground geography in Canadian reality. Achieving the participation of 50 organizations and their Web sites for GAW 2007 is being perceived as a significant accomplishment. Now that this initiative has been successfully carried out to considerable acclaim by the participants, it will be a lot easier to engage more nonacademic organizations in future theme day programs. However, I suggest that we have barely scratched the surface in terms of arranging a "national show-and-tell" that puts Canadians at the global forefront when it comes to people who know their geography, their GIS, and how to use geography and GIS for societal betterment. Also, it is important to appreciate that this is a first-time experiment. A primary task when GAW 2008 preparations begin will be to carefully examine how well the Web site approach worked and to consider ways of making it work even better the second time around. Also exciting is that, though a number of organizations made it known early on during theme day discussions that they actually had little knowledge about the Canadian Association of Geographers, as a result of their participation in the Theme Days process, and in particular the discussions about the geography-subject matter connections, the Canadian Association of Geographers came to be perceived as an organization with which interaction levels needed to be increased. Barry Wellar, Ph.D., is professor emeritus, University of Ottawa; Distinguished Research Fellow, Transport 2000 Canada; and program director, Geography Awareness Week, Canadian Association of Geographers. The first word of acknowledgment goes to Sam Herold, a master's candidate in the Laboratory for Applied Geomatics and Geographic Information Systems Science, Department of Geography, University of Ottawa, for his graphics, formatting, and design assistance on a number of Theme Days and Geography Awareness Week publications. Others who made significant contributions include Alex Miller, Kim Vesterberg, and John Waite of Esri Canada Limited; Bob Patrick and Nairne Cameron, University of Alberta; Zoran Reljic, University of Ottawa; Valerie Shoffey, Canadian Association of Geographers; and Marjorie Wellar, advisor and sharp-eyed editor.